Samsung A series was first launched in the year 2014, now the company had given new life to the phone by adding excellent features and by changing its outlook. The newly announced A series will woo the users with its metal and glass outlook and it also has OIS cameras, fingerprint sensors and a magnetic strip enabled for Samsung pay. The global releasing date and the pricing are not announced by the company. Samsung A7 is the high-priced model of all, but it has wonderful features like 5.5 inch AMOLED screen with 1080-pixel resolution, octa-core processor powered by android 5.1 version lollipop. The phone looks amazingly narrower and it is built with metal and glass bodies. The battery is enhanced with 3,300mAH for fast charging, the RAM is 3GB and internal storage space is 16 GB and 128 GB micro card slot is also present in it. OIS Camera is 13MP at the rear and 5MP in the front both rear and front camera has the F1.9 aperture. Connectivity options include 4G, Wi-Fi, Bluetooth 4.1, micro USB and other required sensors. 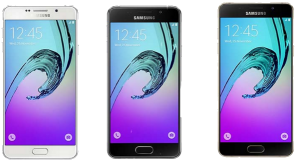 2016 Samsung A5 slightly differs from the specifications of A7. It has 5.2 inches super AMOLED screen with 1080-pixel resolution, octa-core one processor with 2GB RAM and 16 GB internal memory. The camera of A5 has the same specifications of A7 and it also has all connectivity options mentioned in A7. Samsung A3 2016 model is the highly upgraded model of all; it has a qHD screen with 4.7 inches super AMOLED screen of 720-pixel resolutions. The camera has no OIS, but the specifications are same, 13MP rear and 5MP front with f/19 apertures. It is powered by the 1.5GB RAM and internal memory of 16GB. The battery has 2,300mAh, the connectivity options are same like A5 and A7, but it is an only A series model which misses out fingerprint sensor.